Every Monday this year we are highlighting a unique Vegas wedding venue in the Ultimate Vegas Wedding Guide! 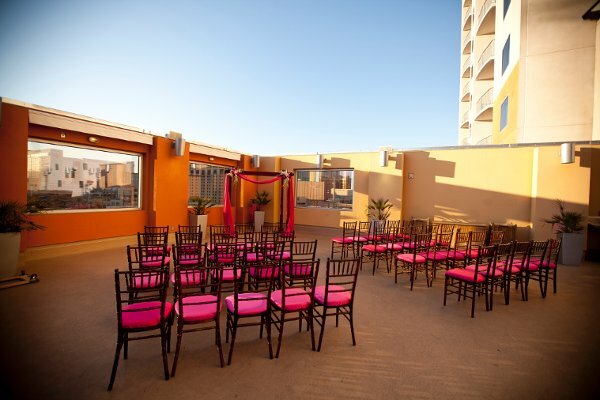 Today is the warm ambience of Platinum Hotel and Spa, the perfect spot to host a sunset wedding overlooking The Strip from one of their two outdoor venues with a view! 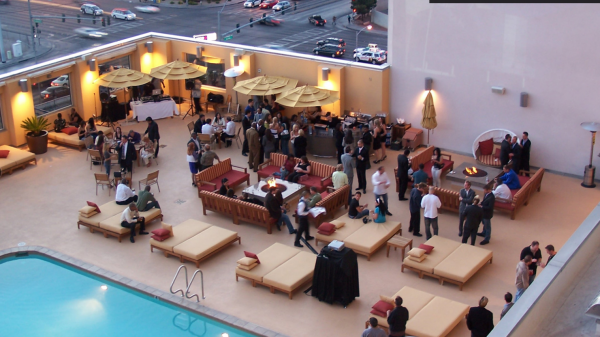 Platinum Hotel and Spa, just a stone’s throw off The Strip (five minutes by car, 20 on foot) not only offers a non-smoking, non-gaming boutique hotel experience but also stunning vista views of The Strip, as well as modern furnishings and colors. With indoor and outdoor venues, there is a wide selection of choices for weddings, and anything from a rooftop cocktail reception to a pooltop ceremony on a lucite catwalk is possible. Packages include a ceremony and four hour reception, and an on-site coordinator is there to help with the details of planning. Misora Rooftop Ballroom & Terrace (hosting 80 seated guests) is a open air venue on the 17th floor with an enclosed ballroom featuring floor-to-ceiling glass windows looking out over Las Vegas, including The Strip and mountains. Kil@wat Restaurant has a blue and silver color theme and adjoining pool deck with cozy fire pits and views of the city lights. 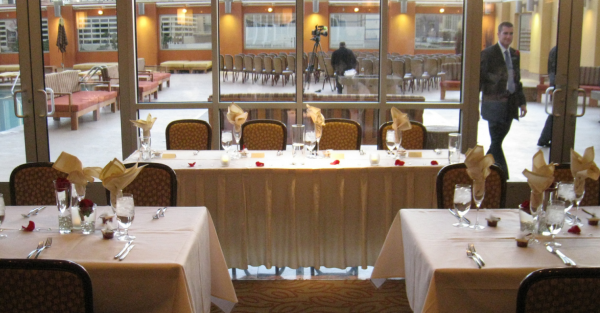 It can host up to 120 seated guests. Complete catering packages or a la carte options are available with open bars, buffet or plated meals and passed hors d’oeuvres starting at $75 per person. While they offer a la carte pricing, the real winner here is the all-inclusive packages with excellent pricing for up to 120 wedding guests, including a four hour open bar, wedding suite, champagne toast, dance floor and entertainment, plus more. Trendy upgrades on their catering menu include mashed potato bars, slider stations and dessert bars serving up bananas fosters and sundaes. Options are customizable to your wishes and you may design your own menu. New for 2014 is pricing for just a ceremony, starting from $2000 with upgrades for live music, chairs and more. Oh, and don’t forget about those panoramic views, accented with warm firepits and casual seating. 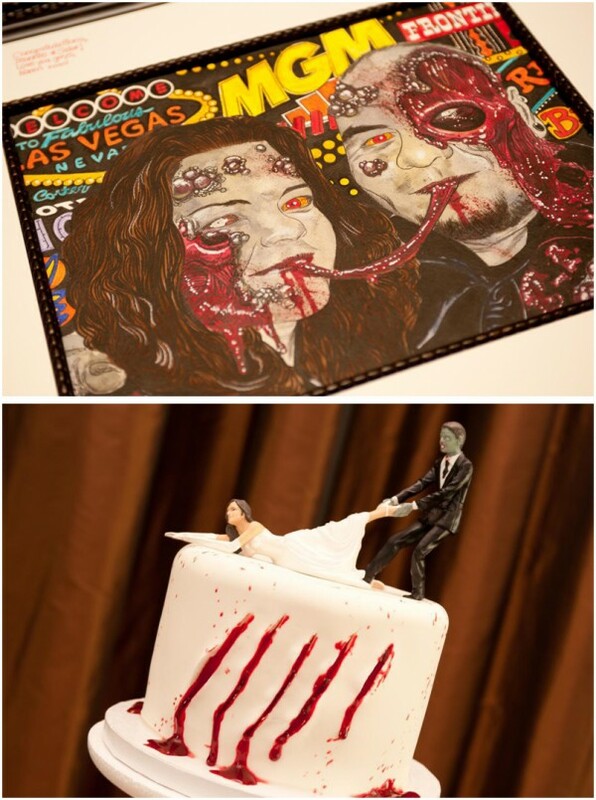 Rooftop Wedding in Vegas, Complete with Darth Vader and zombies! 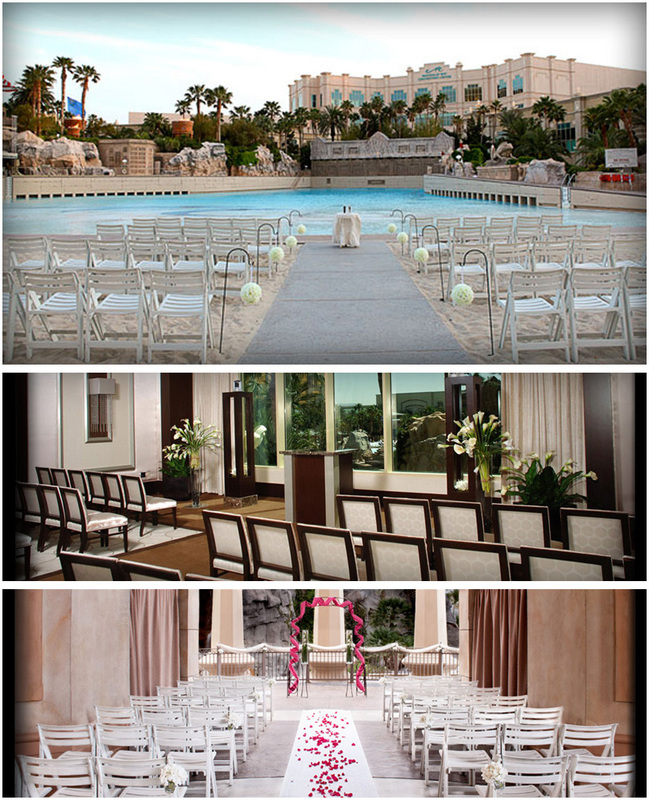 Searching for the perfect venue for your Las Vegas wedding? Be sure to check out the other posts in the Ultimate Vegas Wedding Venue series, or peruse the Vegas Wedding Venue Directory! If we’re talking wedding venues with spectacular views, the rooftop at Platinum Hotel & Spa has to rank high on that list. Meg and Ben’s hip wedding with DIY projects galore at Platinum was photographed by Brilliant Imagery and included a rocking party complete with karaoke and interpretive dances. (Um – awesome!) 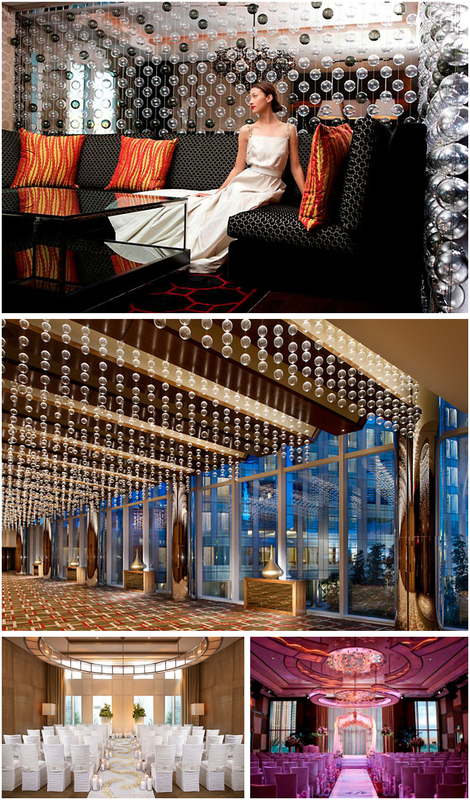 You will not only love the always amazing views from the hotel’s skydeck, but all of the handmade details. The paper goods were made by Meg herself – in fact, the wedding inspired her and she now runs her own company NupptialDesigns, specializing in wedding items. A baker friend from D.C. unable to supply a cake for their destination wedding made an amazing cake topper that combined the TV show “Parks and Recreation” with the Green Bay Packers. Meg’s bouquet included kale, her favorite vegetable, and was wrapped in doilies made by Ben’s grandmother. The blazing blue bottle centerpieces were from Saratoga Springs Water Company, and it was the cobalt blue and silver colors that inspired the entire wedding palette. Keep reading for some excellent tips from Ben and Meg on planning a destination DIY wedding in Las Vegas! 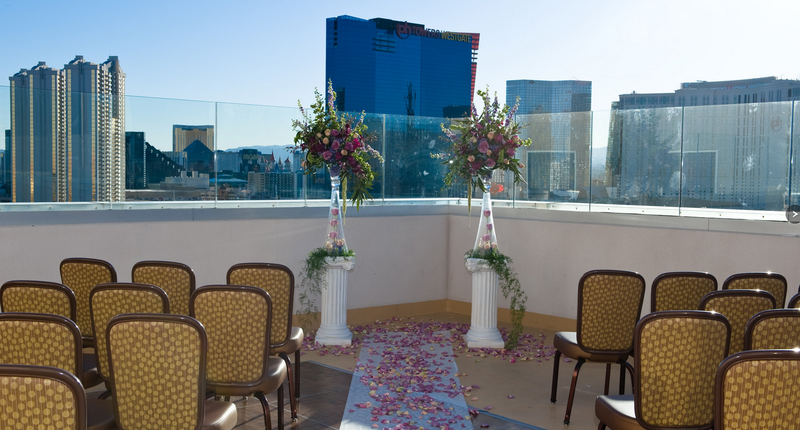 Party on the rooftop and dance the night away at your reception with a clear view of the lights and action of the one and only Las Vegas Strip: let’s talk rooftop weddings in Las Vegas! When I first started to compose this post, I truly believed there were just a handful of venues that would allow you to host a Vegas wedding with a birds eye view of the city. Truth of the matter is, there are dozens of them, suitable for every size and budget, and scattered across the city with a variety of views. 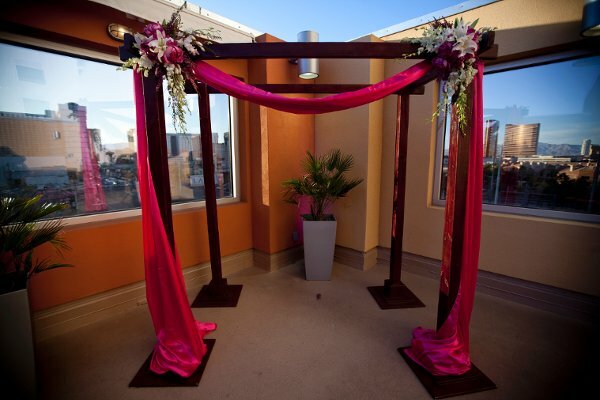 These venues allow for indoor and outdoor rooftop, patio and sometimes even poolside weddings and receptions. Unless otherwise specified, most of these venues offer combined indoor and open air, outdoor spaces, and are available for ceremonies or receptions – or both! Mandalay Bay: Mix has long been a favorite venue to have a cocktail and look up the Strip, so why not make it your wedding venue? Palms: Although fully outfitted with new decor and design, ghostbar still boasts extraordinary views from its skydeck, as does Moon nightclub. 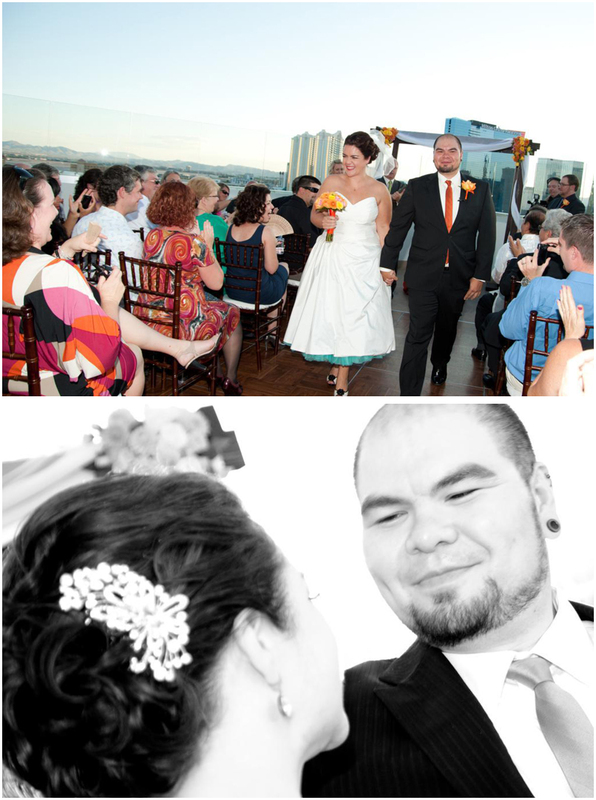 Today’s wedding is LVW’s very first bride submitted wedding, and it is amazing. I’m SO happy Jeannie wrote me to tell me about her big day because it’s so full of amazing details, I know you’re going to love it too as you check out the photos of the event taken by Chiemi Photography. 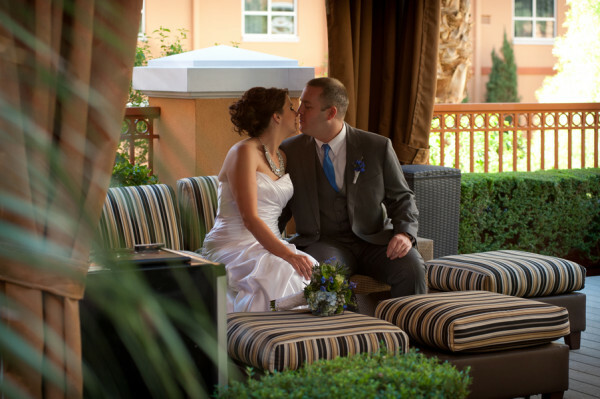 Jeannie and Salar came from Canada to get married at the Platinum Hotel in September of this year – they said that a Las Vegas wedding was something they always had in mind, since they didn’t want a large traditional wedding nor did they want anything too religious. Salar suggested Vegas as a possible wedding location before they even got married, so it seemed the place to go! Salar is very into zombies and I wanted to make sure there were also details of that as well – so he picked the cake topper and cake design. We picked up the topper on our scouting trip at the lobby store at the Palms and he painted the groom up to be zombified. Our guest book and poster was a custom portrait done by Rob Sacchetto of Zombie Portraits. Amazing details – including a guestbook, skull necklace and cute cupcakes from Retro Bakery. Jeannie and Salar decided on the Platinum Hotel and Spa (just off the Strip) via the forums on The Knot and did a scouting trip a year before the wedding. They wanted something that was unusual, but could hold a fair amount of people – so up to the rooftop it was! Isn’t the view fabulous from up there? The bride’s dress was altered to tea-length by a seamstress and she added a colored crinoline by Swank Underpinnings in robin’s egg blue to make it pop. So awesome! 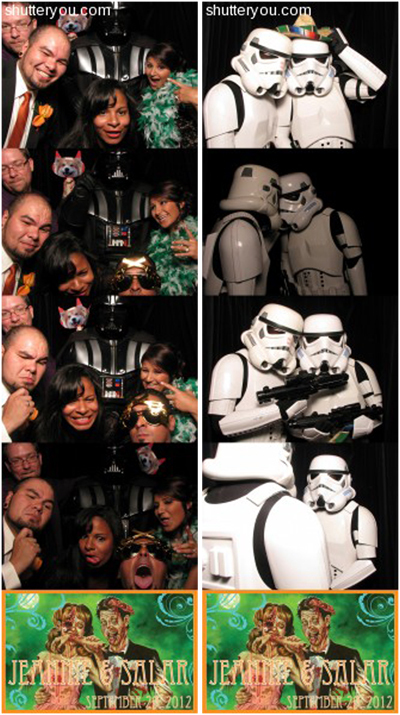 One of the best surprises had to have been the Star Wars droids and Darth Vader that showed up though. The groom had no idea they were coming! And the most incredible thing is that they don’t charge a fee, but instead ask you to make a donation to the Children’s Make A Wish Foundation. That wasn’t all the entertainment at this rocking party though – Travis Allen made an appearance as Elvis and got a conga line going, a DJ from All Night Long rocked out the hits pleasing music fans with very diverse tastes (from heavy metal to classic Iranian songs) and there was even a double decker bus ride to take the guests to see downtown Vegas and Fremont. What a party! 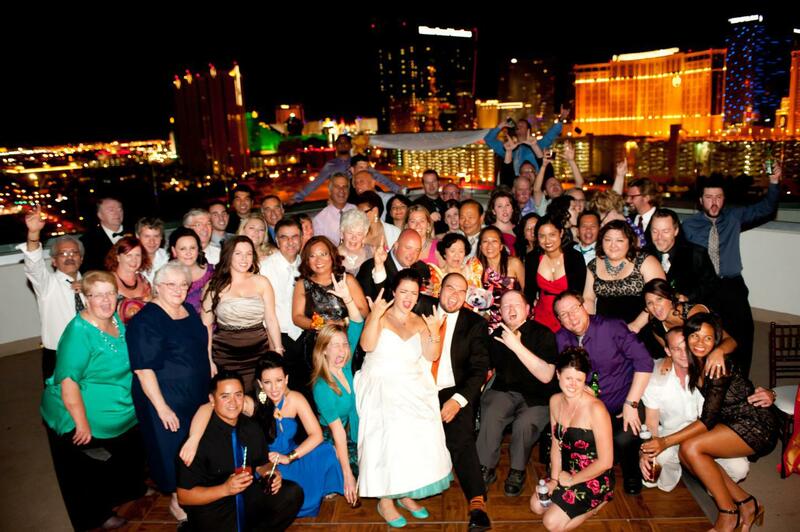 Love the group shot – I think this is integral to a small Vegas wedding for everyone to remember. Wow. Thank you SO much Jeannie and Salar. Your wedding looked like a blast, there were some amazing details and you had some great words of advice. Please remember brides, the submissions are open to everyone. Read more about submitting your wedding here. Here are eight fabulously fresh Las Vegas venues you may not have considered for your wedding. 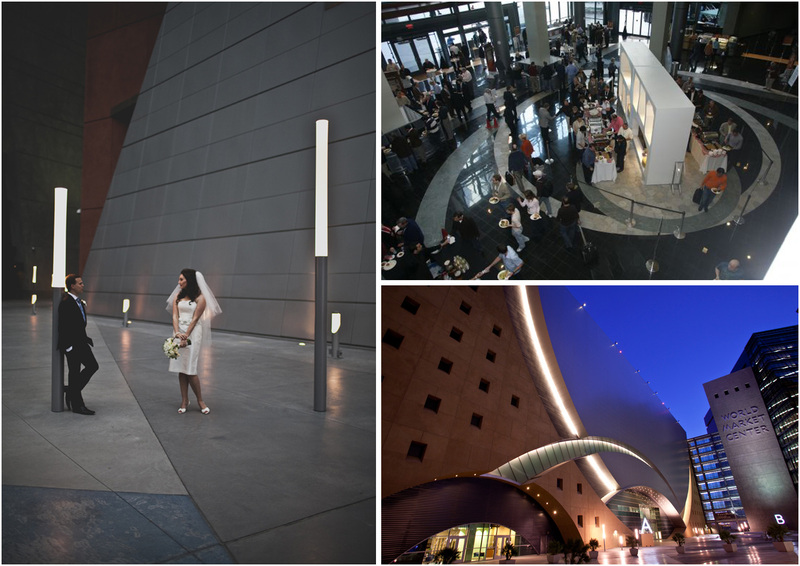 Did we leave out your favorite modern Las Vegas venue? Share it in the comments! Update: here are 7 More Modern Wedding Venues! 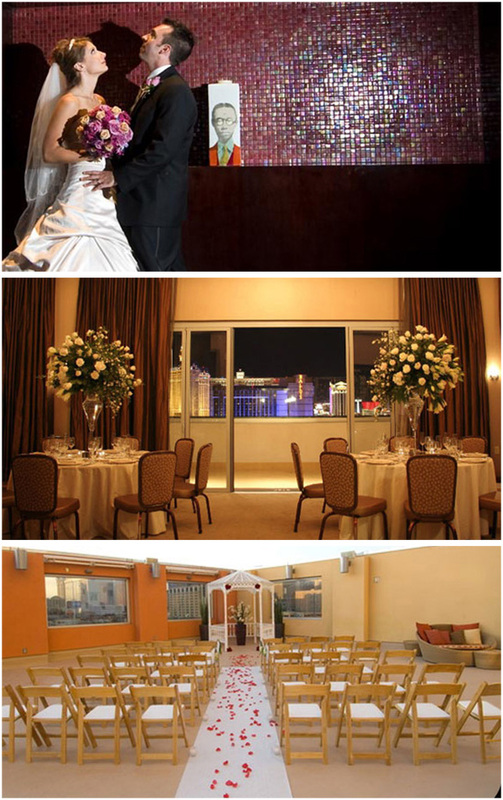 You might also like to browse through the coolest wedding venues in Las Vegas for ceremonies and receptions in the brand new Little Vegas Wedding Venue Guide! We’ve got them all, from modern industrial style warehouses to funky historic museums! 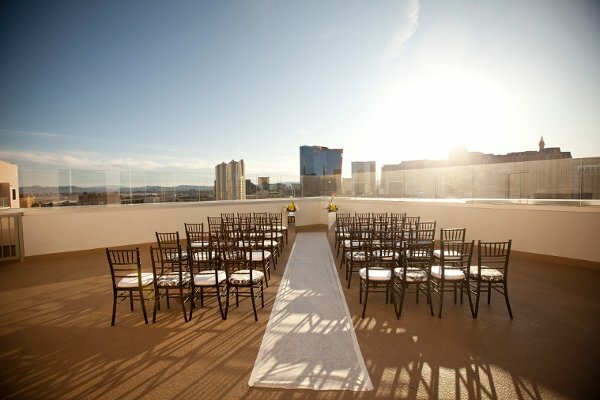 Photos courtesy Mandarin OrientalLas Vegas’s Mandarin Oriental hosts one of the most expensive wedding packages in Vegas, but for those of us with more modest budgets, they also offer affordable options in one of the newest, most modern hotels on The Strip. Photos by Gaby J Photography, Brian Leahy and Aria. CityCenter with three hotels (four if you count Mandarin Oriental) offers a range of options for those seeking a modern, chic venue for a wedding ceremony, reception or cocktail party. You could use a ballroom or rent a suite at Cosmopolitan, Aria or Vdara and hold your ceremony there, and do a photo session amongst the modern art pieces and sleek lines of CityCenter. Aria opened a dedicated wedding chapel in 2013, as well. Cosmopolitan has a variety of modern art which makes for fantastic photos and sets the mood of the event, while Aria and Vdara have gorgeous modern waterscapes and landscaping details that look great in photos. 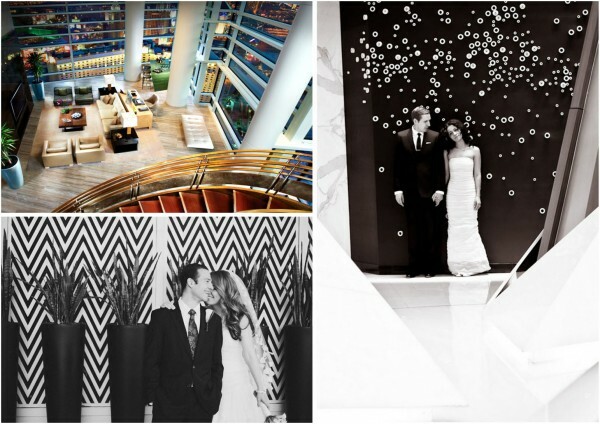 Head over here for more information, pricing and photos of real weddings at various venues at ARIA, Vdara and Cosmopolitan. Mandalay Bay is primarily a tropical themed hotel, but it actually features a very chic wedding chapel with modern touches and neutral colors. Mandalay Bay offers a number of unique options for wedding ceremonies and receptions, but their chapel itself is quite modern. With cubic touches and neutral colors, it has a definite modern slant. 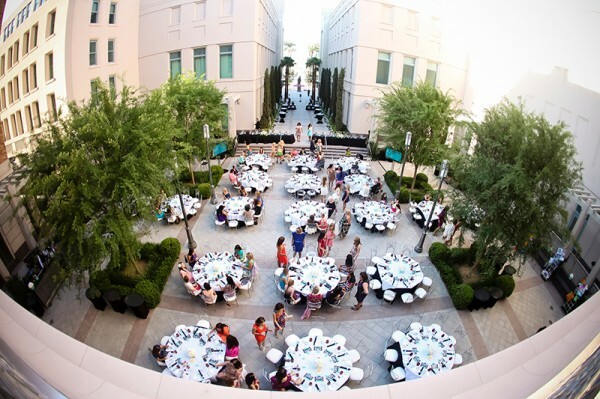 World Market Center Las Vegas offers modern, clean spaces, on-site catering, indoor and outdoor spaces and event planners. Special features like state of the art entertainment an A/V setups as well as indoor water features and Strip views make this a unique venue you might otherwise consider. The Smith Center is one of Las Vegas’ newest venue choices, and is actually a world class theatre and performing arts site. The venue hosts a number of features including packages with rentals included, well appointed halls with incredible architectural details, indoor and outdoor spaces and as one might expect for a theatre venue, grand stages and awesome acoustics. Designed by architect Frank Gehry, the Cleveland Clinic Lou Ruvo Center for Brain Health is a testament to the architect’s design sense and will wow any fan of modern architecture you know, both inside and out. 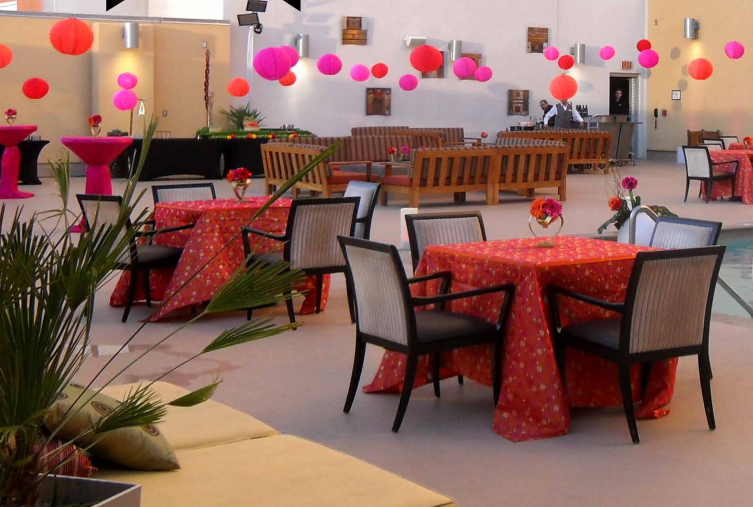 Part research center for degenerative brain diseases and part event venue, the Keep Memory Alive Event Center portion of the building can be rented for weddings and other special occasions with the proceeds going to fund the center’s research. For 4 hours the facility rental rates are $5,000 for events Mondays through Thursdays and $7,500 on Friday, Saturday and Sunday. Additional time is $500 an hour. This includes use of the in-house furniture which is a fabulous array of Frank Gehry designed sofas, Pedrali chairs, tables and bars – but that’s just the start, and an entire decor list can be provided upon request. Furnishings are as modern as the exterior and a breezeway courtyard allows the space to “breathe.” The building itself facilitates extremely unique photos taken inside and outside of the space, and the location provides easy access to the nearby downtown district and Neon Museum. And it’s nice to know that the fees go to a good cause. 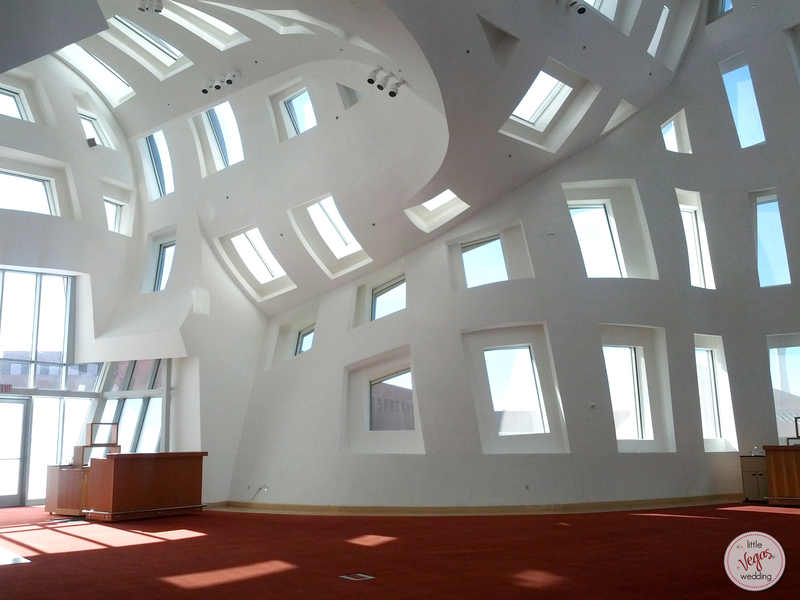 Head here for more information and photos of the event space at Lou Ruvo Center. Looking for yet MORE modern venue choices? 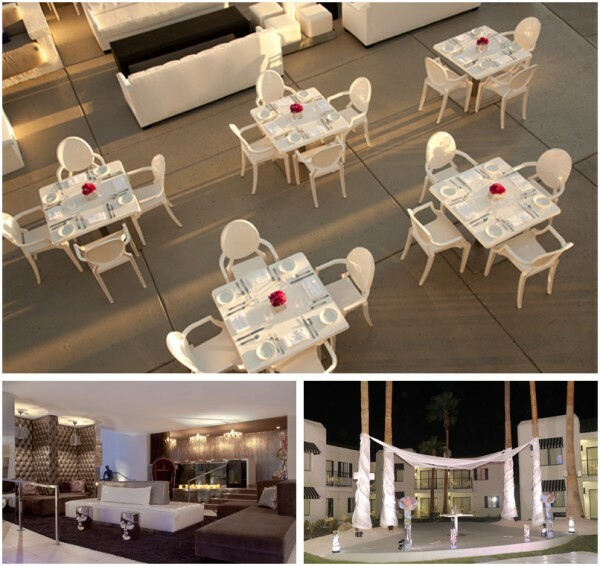 Check out 7 More Modern Wedding Venues in this post. And if none of these venues fit the bill, check out our mega-directory of unique Las Vegas wedding venues including country clubs, chapels, desert locations and more! Do you ❤ Vegas Weddings? Get Daily Updates & More by Liking Us on Facebook!